Tracy Raye Hickman is a best-selling fantasy author, best known for his work on Dragonlance as a game designer and co-author with Margaret Weis. Tracy was born on November 26, 1955, in Salt Lake City, Utah. He is a member of The Church of Jesus Christ of Latter-day Saints, sometimes casually called the Mormon or LDS Church, and currently lives in St. George, Utah, with his wife, the former Laura Curtis. Together they have four children. Tracy graduated from Provo High School in Utah and then went on to serve a two-year mission for the Church. Hickman's mission was to Indonesia, but the first six months were spent in Hawaii waiting for the proper visa. He still speaks conversational Indonesian, and he sometimes bases the magical phrases he uses in his books on the language. He then attended Brigham Young University. He married Laura within four months of his return from his mission. “They said it would be easier to publish my adventures if I was part of the company. So, we made the move from Utah to Wisconsin. It was a terrifying experience. We had no money. My parents begged us not to venture into such foreign territory to pursue such a bizarre career. My father wrote that there was a secure job as a fry cook in Flagstaff (where my parents were living), and he pleaded with me to come take it” (Weis, Margaret [April 1987]. "TSR Profiles". Dragon (Lake Geneva, Wisconsin: TSR, Inc.). Tracy came to TSR in 1982, and soon thereafter management announced the intention to develop a series of role-playing adventures based on dragons. Tracy's proposal, code-named Project Overlord, was the Dragonlance Chronicles, which led to his association with Margaret Weis. This was the first project TSR had undertaken that would include adult novels as well as games, calendars, and other spin-off products. The original Drangonlance team was formed under Tracy's leadership. By 1987, the successful Dragonlance project had sold two million books and a half million adventure modules (Wikipedia.org). Hickman and Weis also wrote the Darksword trilogy, the Death Gate Cycle, and the Sovereign Stone trilogy. Since 1985, they have jointly authored over forty book titles. Tracy's first two solo novels, Requiem of Stars and The Immortals were published in the spring of 1996. The Hickmans have been publishing game designs together for over twenty-five years including the popular and innovative Advanced Dungeons & Dragons Ravenloft module. They published their first joint novel, Mystic Warrior, in 2004. Tracy and Laura have been producing their DragonHearth podcast since December 2005. Tracy recently announced starting two new fantasy series: one being the six-book Dragonships series with his long-time writing partner Margaret Weis and the other the three-book Drakis series with his wife, Laura (Wikipedia.org). In 1999 Pyramid magazine named Tracy Hickman as one of The Millennium's Most Influential Persons "at least in the realm of adventure gaming." 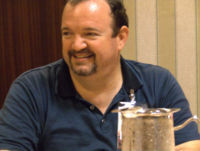 The magazine stated that Tracy Hickman and Margaret Weis are "basically responsible for the entire gaming fiction genre." Hickman was inducted into the Origins Hall of Fame in 2002, recognized in part for "one game line turned literary sensation: Dragonlance. Tracy remains highly active in his church and pursues a number of hobbies including guitar, singing, piano, models, Laserdisc movies, computer games, television production and animation. He loves to read biographies, histories and popular science books (Official Website). "My faith is as much a part of my life as breathing. I strive to commit my time, talents and energies into building up the Kingdom of God and bringing the truth of the 'good news' to all who need to hear it. I am not always successful and I often stumble along the way -- yet my faith remains the rock on which I strive to build my life and the lives of my children. In an uncertain world, here I have found a solid place on which to stand. "I was 'born into' the Church. My great-grandparents crossed the plains with the LDS migration in the mid 1800's and were occasionally prominent (if infamous) figures in the early church. Interestingly, this deep historical background was no guarantee. While I was raised in a predominantly Mormon community with the vast majority of my associates being LDS as well, I didn't have much affinity for the Church or its teachings as I grew up. It was simply part of my life and the teachings that made up my young years came to me with no more emphasis than my reading lessons or mathematics. "All of this came to its apathetic head while I was a teenager -- not surprising in that period of life where everything comes into question. I had not managed to read the Book of Mormon or the Bible despite several years of attending the LDS seminary both in Junior High School and High School. Many of my friends were preparing to go on missions; I was not going to join them in that effort. I had decided that I had a good job, a wonderful girlfriend, and no real need to toss all that away on a mission for a church to which I was mostly indifferent. "I cannot say how others are called on their missions but for me it happened in the projection booth of the Academy Theater in downtown Provo, Utah during an weekday evening show in October of 1974. I have been pondering my fathers question. Despite my own luke-warm attitudes, I was still a thoughtful nineteen-year-old and occasionally did turn to the Bible for comfort. That night, as I pondered what I wanted and, more importantly, what God wanted, I was suddenly filled with the spirit of truth so strongly that it felt like a physical blow. I knew -- just KNEW -- that I had been called to serve God and the knowledge wouldn't leave me. This page was last edited on 24 November 2017, at 21:07.